A new report wants to burst the idea of a Toronto housing bubble. Yes, condo sales and construction are booming, but the Royal Bank of Canada report says there is no housing bubble because the city’s number of new housing units is in line with demographic needs. 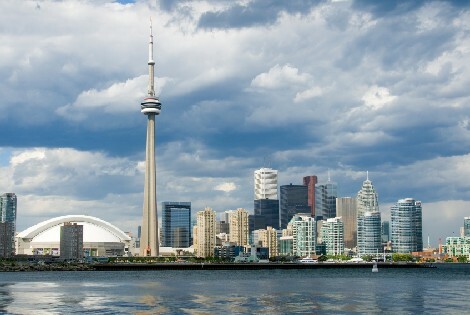 The Greater Toronto Area sees an influx of close to 100,000 people each year. That translated to approximately 38,000 new households per year from 2006 to 2011, according to RBC and Statistics Canada data in the report. One constraint to urban development is the Ontario government’s plan to handle growth and development in the Greater Golden Horseshoe, which is known as “Places to Grow” and seeks to curb urban sprawl. Faced with the task of accommodating the 38,000 new households, new housing in Toronto has nowhere to grow but up. May 2012 saw a record 44,100 condos and apartments under construction, as well as 6,200 multiple units, which are detached and row houses. The report’s findings also aim to quell fears that scores of empty condominiums are piling up. “Concerns that large numbers of newly built condo units are sitting empty are simply not supported by the statistics,” the report, released Tuesday, says. The report says approximately 7.5 per cent of the condo units completed in the previous 12 months are unoccupied, and estimates that unoccupied units represent close to 0.2 per cent of the stock of multiple units. Both figures are less than numbers from the 1980s when Toronto saw a housing bubble burst. While investors represent a large share of condo buyers, concerns about property “flipping” might be overblown, the report adds. Canada Mortgage and Housing Corporation reported last fall that only 10 to 15 per cent of new condos are listed for sale within 12 months of registration. Tuesday’s report says the majority of condo investment properties are actually helping to fill a gap in the rental market. “The biggest risk that we see for the coming years is a possible mismatch between the types of condo units bought by investors and the types ultimately demanded for occupancy,” says the report. A mismatch could occur with a greater emphasis on small, single-unit apartments when currently about three-quarters of rental demand is for high-rise multi-family units. However, the report is quick to dismiss these concerns, pointing to the demand for rental units. The report suggests that recent changes that tightened mortgage rules will push more people into the rental market. As of last month, the maximum amortization period dropped from 30 to 25 years for government-insured mortgages, and the refinancing limit was capped at 80 per cent down from its previous 85 per cent. The report notes that while the city saw an 18 per cent increase in condo rental units, the rental vacancy rate dropped to 1.1 per cent last year.